Are you guilty of these three marketing design mistakes? A successful marketing piece, whether print or digital, is a combination of words and images designed in an attractive, engaging way with the sole purpose to get your customers to buy from you. You want your marketing to stand out, look professional and more appealing than your competition. 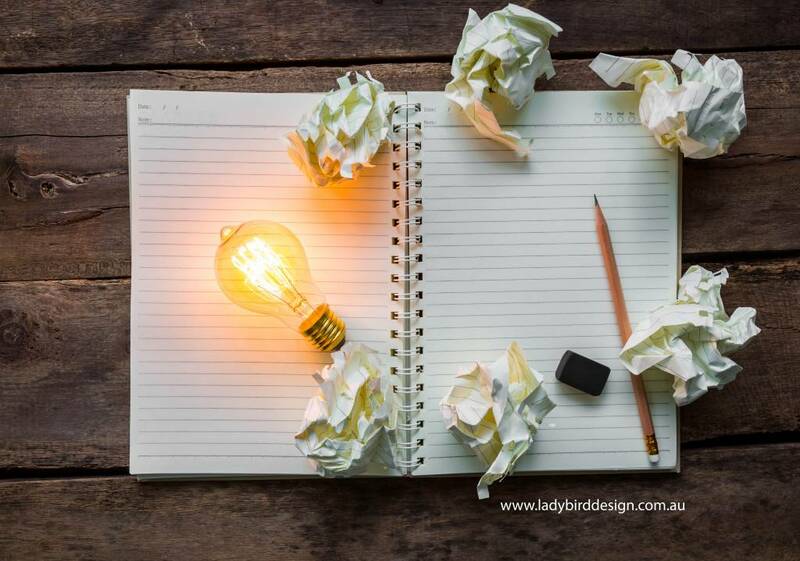 Before you send that new brochure to the printers or ‘post’ that Facebook ad; see if you’re guilty of any of these marketing design mistakes! 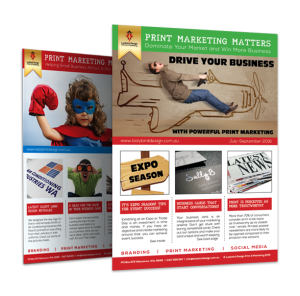 Take a look at some of our marketing brochure layouts for ideas. Images are powerful communicators that can make the reader stop and look. You want to engage your audience. Take the time to find images to suit your offer. Think about the mood you’re trying to set and how you want your audience to react. Not only does it get in the way of the image and distract your reader but it also gives the impression you have merely downloaded it from Google without permission. *NB: Just because an image is online, this does not mean you have the legal right to use it. Nor can you use it and ‘credit’ the author/source (if known) without their permission. In most cases, you will need to pay a licence fee (royalty) to use it. Avoid low res images in print. Compared to online where images should be low res at 72ppi, print is a whole different ballgame. You need clean, crisp, high resolution (300ppi) images or they will look grainy, pixelated, difficult to see and just plain cheap, tacky and amateurish. 2. Bad colour choices – Colour psychology plays an important role. Consider the tone of your piece. Yellow is seen as the happiest colour in the spectrum. It stimulates the feeling of cheerfulness, optimism, warmth. Blue is the most popular colour. Light blue can be uplifting, positive, cool. Navy represents trust, integrity, loyalty. Red is compelling, commands attention, igniting passion, danger and excitement. Avoid colours that clash with one another. Content written in red on a black background can be impossible to read, both in print and online. Pink against red is another headache. Opt for dark colours against light backgrounds and vice versa so your text can be easily read. Don’t print in black and white. Many people think it’s cheaper to print in mono (black) rather than full colour. In the age of digital print, most printers provide both options at the same price. Colour is so effective in print, don’t be afraid to use it. 3. Using too many fonts. It’s tempting to try out every typeface on your PC – but DON’T! Too many typefaces create chaos in your marketing. Choose one or two typefaces and vary the sizes and weights. You can create interest, order and impact by aligning elements, scaling your text and using visual hierarchy to lead your reader through much more effectively. Choose easy to read typefaces for long passages of text. The right typeface can help convey your message further. Looking for something sports related? Try Princetown. Wanting a 1930s feel? Look at Premier Shaded. Wanting to make your numbers looks like a calculator? Quartz is ideal. Each of these typefaces are quite distinctive in their own way. Compliment them with a less ‘showy’ typeface such as Helvetica or even Arial so not to distract from the theme you’re creating. These small changes will make your marketing look more professional and help you attract your target audience in a more engaging, motivating way. Don’t make it easy for your competition to capture your customers.